All eyes were on the Greenback this week, thanks to the U.S. presidential elections. However, the pound somehow managed to steal the show, with 5 out of the top 10 movers being pound pairs. Not only that, the pound ended up being the king (or queen if you like) of pips this week. How on earth did that happen? Well, time to find out what was driving price action on the pound and the other currencies this week! Although I’m pretty sure he looks more like this to many people. Anyhow, the Greenback gapped higher against most of its peers when the new trading week opened, thanks to FBI Director James Comey’s announcement over the weekend that no new email-related charges would be levied against Hillary Clinton. The Greenback then traded mostly sideways after that, as forex traders waited for the U.S. presidential elections to get under way. Interestingly enough, the Greenback began getting some buyers when Americans finally went to vote, probably because most market players were expecting an easy Clinton win, since that’s what almost all mainstream polls were predicting. Much to their dismay (but to the glee of Trump supporters and contrarian traders), however, exit polls and actual voting results began to point to a Trump victory. The gospel that was being preached by most market analysts at the time was that a Trump victory would be disastrous for both the U.S. and global economy, so the Greenback quite naturally got stumped by most of its peers. The Greenback managed to advance against the Kiwi and the Aussie, though, thanks to the tidal wave of risk aversion that slammed into Asian and European markets at the time. The Greenback also took ground from the Loonie, but we’ll talk about that later. Quite interestingly, the Greenback began to regain some poise when Trump was just 20 shy from the 270 electoral college votes needed to win. This was likely due to profit-taking by the shorts, as Trump’s victory began to look inevitable. However, Greenback pairs noticeably got bid higher when word got around that Clinton personally called Trump to offer her surrender. This was confirmed a few minutes later when Trump said the same thing during his victory speech, which caused the Greenback to spurt higher still. Speaking of Trump’s victory speech, his speech was actually rather presidentiable and calming, if you listen to it with an open mind. And that plus Clinton’s surrender probably reduced uncertainty by a lot, since European equities got resuscitated while U.S. equities skyrocketed, as risk appetite came back with a vengeance. After that, the Greenback continued climbing higher, as market players looked forward instead. 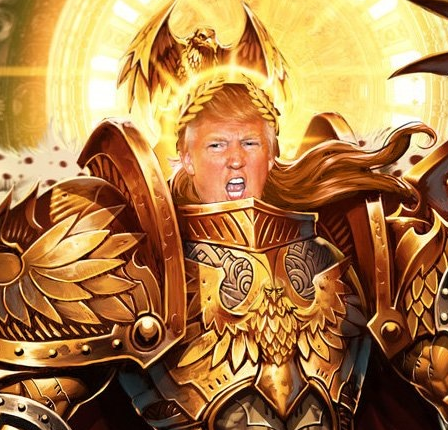 The gospel about a Trump presidency being disastrous was now branded as heresy, and market analysts began preaching the new gospel that Trump’s presidency would be, well, Trumptastic. Specifically, expectations were high that banking regulations would be loosened, which boosted banking shares. Investors also looked forward to Trump’s promise to lower taxes while increasing spending on the military and infrastructure, as well as his promise to bring back jobs. Forex Gump has the deets on some of Trump’s economic policies, which you can read here. The pound was trading sideways for most of the week. And while the U.S. presidential elections did inject some volatility into pound pairs, price action was not exactly uniform. Strangely enough, the pound began to move uniformly higher against ALL its forex rivals, starting on Thursday’s late European / U.S. session, as highlighted on the chart above. Not even the mighty Greenback could resist the pound’s advance. Market analysts were baffled by this wonky price action, so nobody honestly knows for sure. Many theories were presented, although the most popular one is that the pound’s mysterious surge was due to investor expectations that populist, anti-establishment movements in Italy, France, Germany, and other parts of Europe would prevail, with Brexit and Trump’s victory as signs of the times. This was viewed as net bearish for the euro, but positive for the pound, due to the reduction of Brexit-related bearish pressure on the pound. That’s what this piece from Bloomberg is saying, which is also what this piece from Reuters is saying. Another popular theory, which is mentioned on this other piece from Reuters, is that a Trump presidency would allow the U.K. to get a better post-Brexit trade deal. Sounds plausible, I guess. If y’all can still recall, Obama was staunchly anti-Brexit, and he shot down the idea of a “fast-track post-Brexit trade deal” back in September when he met with British PM Theresa May. Well, whatever the case may truly be, the fact still remains that the pound ended up as the one currency to rule them all. Makes you wonder if the pound’s strength will persist next week, huh? As I mentioned earlier, Trump’s victory and victory speech, as well as Clinton’s surrender, was able to revive risk appetite, so much so that most equity indices were able to close out the week with gains. The equity markets of many emerging market economies got whupped, though, probably because foreign investments, particularly from the U.S., are expected to flow out now that Trump is gonna be in charge. Anyhow, here is how some of the major equity indices fared. Quite naturally, the risk-friendly environment was not very friendly at all to the safe-haven yen, which is likely why it got dumped. Another sign of the risk-on vibes was the very intense bond-selling that sent yields soaring. Japan’s current monetary policy is to keep the yield of Japanese government bonds close to zero, so the widening yield between Japanese bonds and other bonds quite naturally made Japanese bonds even less attractive than before, which also likely dampened demand for the yen as well. The Kiwi had a mixed reaction to the U.S. presidential elections. It then jumped higher when the RBNZ announced a widely-expected rate cut before tumbling back down when RBNZ Governor Wheeler said during the presser that “there’s a 20% probability of a further cut,” which implies that the RBNZ still has a slight easing bias. Moreover, Wheeler had this to say on intervention:. Normally, Wheeler refrains from discussing the possibility intervention, but he openly talked about it. He avoided answering on whether or not the RBNZ plans to intervene soon, though. Forex Gump has a write-up on what else RBNZ Wheeler had to say, so read it here, if you’re interested. The Loonie came out mostly on top, even though oil benchmarks took a trip to negative territory for the week, largely on reports that OPEC increased its oil output to a record high of 33.64 million barrels per day in October. This exceeds September’s reading by 240,000 barrels per day and made the market doubt OPEC’s planned production cut. The Loonie actually started the week with an advantage, given that it gapped higher against its rivals, likely on the back of news that the FBI won’t be charging Clinton. But as I noted earlier, the Greenback was able to advance against the Loonie when signs began to point to a Trump victory. This was likely because oil took a tumble back then, and this was blamed on expectations that the global economy would slow further under a Trump presidency, which would also mean lower demand for oil. Well, that’s what some market analysts were saying. 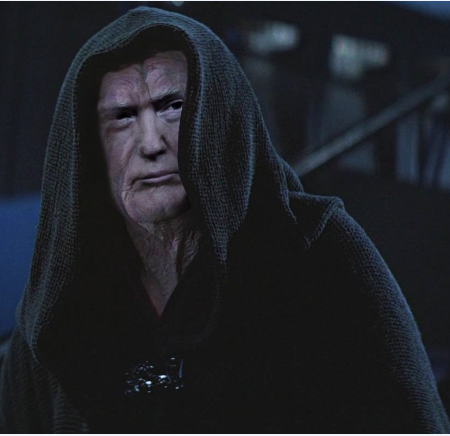 However, this was before it became heresy to even consider that a Trump presidency would be a good thing. When it became imminent that Trump would win and when Clinton later offered her surrender to Trump, the Loonie rallied quite hard. It even managed to retake some ground from the Greenback. Aside from opposing currency price action and the slight recovery in oil prices, it also probably helped that Canadian PM Justin Trudeau vowed on Wednesday night to “move forward in a positive way” with regard to a Trump presidency, which likely eased some uncertainty, especially since Trump has expressed support for the Keystone XL pipeline in the past. After that, the Loonie had a more mixed performance as oil suffered heavy losses due to the OPEC report I mentioned earlier. The euro’s price action was driven by U.S. elections, as y’all can see on the overlayed chart above. The euro strengthened across the board when Trump began to lead. And it likely helped that European equities were tumbling hard. However, when risk appetite returned, causing European equities to rally hard, it became the euro’s turn to tumble. And as I discussed earlier, some market analysts attributed the pound’s strength during the week to weaker bearish pressure on the pound, now that market players are focusing on higher uncertainty in Europe in the wake of Brexit and Trump’s victory, which may be signs that populist, anti-establishment movements in Europe would also prosper. This higher uncertainty likely weighed down on the euro as well. It sounds repetitive by now, but the Swissy’s price action was driven by the U.S. elections. Risk aversion dominated when signs began to point to a Trump victory, so the safe-haven Swissy got a lot of loving. Risk-taking later returned, so the poor Swissy got abandoned by its former lovers. That’s sad! Anyhow, the Swissy’s price action became mixed after that, but the prevalence of risk appetite is likely why the Swissy ended up being a net loser overall. I’m sure you’re pretty familiar with already, so I’ll just run through it briefly. The higher-yielding Aussie fell hard when Trump began to lead and risk aversion drowned the markets. However, the Aussie manage to recover a bit when risk appetite later returned. The Aussie then tried to rally further when risk-taking persisted. However, the Aussie (and the Kiwi as well) got crushed halfway through Thursday’s morning London session. Unfortunately, there were no apparent catalysts and market analysts seem to be ignoring that wonky price action. There was also risk-taking aplenty and commodities (other than oil) were in rally mode back then, as I noted in my session recap, which makes it even weirder. Commodities did start dipping later, although the Aussie already returned a large chunk of its gains by then. Anyhow, things made sense again come Friday when it seemed like Aussie traders traders were turning mainly to the sinking commodity prices, which likely weighed down on the comdoll. Sweet! The 20.51% of you who voted for the pound got it right! I’m sure you’re really happy right now, so congratulations. The 38.46% who voted for the Greenback almost got it right, but I’m sure you’re still grinning from ear to ear, assuming you didn’t get scared off during the initial Greenback slide when Trump began to lead. The 5.13% who voted for the Loonie would have also done well, assuming you spread your trades out a bit. Unfortunately, 17.95% of you voted for the yen. Hopefully, you were able to get out with only a scratch, or even some gains when the yen initially strengthened. 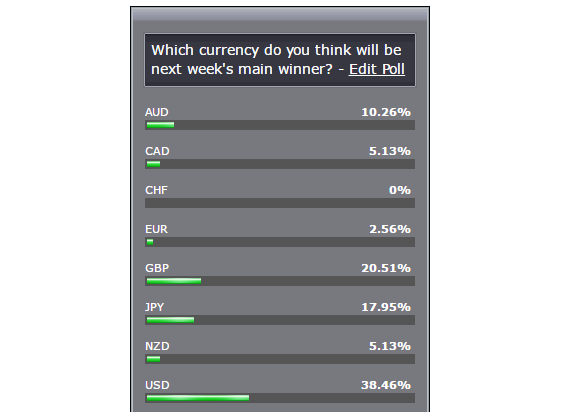 Anyhow, now that you know what the likely drivers were this week (well, it was just mostly about Trump’s victory), and having taken a look at the forex calendar for next week, which currency do you think will come out on top next week? Vote in the poll below!